Yankees baller Robinson Cano suited up in his best blue tights…lol…no, but what I wouldn’t pay to see that. Cano took to his newly signed agent’s digs that would be Jay Z’s 40/40 club for his RC24 Foundation Super Heroes fundraiser & Domino tournament earlier this week. The foundation raises funds for disadvantaged youth in his homeland of Dominican Republic. It also coordinates the “Grand Slam Wishes” program in which the foundation brings terminally ill kids to Yankees games, practices and meet and greets with the players. Below is a video of Cano surprising one of his biggest fans with an impromptu baseball game in NYC in May. In addition to putting major smiles on young kids faces, the RC24 foundation also makes healthcare a major priority. In 2011 New Jersey’s Hackensack University Medical Center opened “The Robinson Cano Pediatric Physical and Occupational Therapy Suite.” As a result of visiting the hospital in 2005 during his rookie season with the Yankees and befriending a young boy who was a cancer patient. 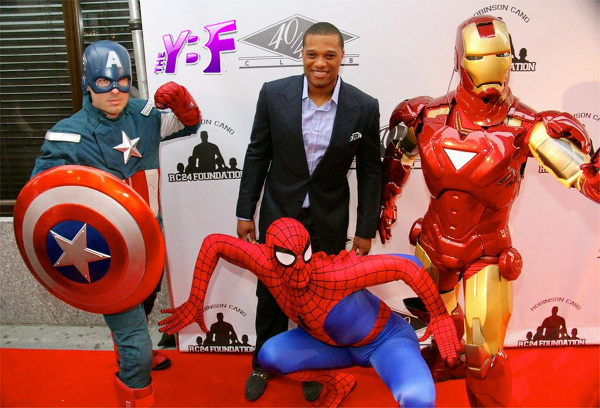 Cano may not dress like a super hero but he certainly has their attributes.